The founders of the Yellowknife Women’s Society listened to what women needed and then they got to work. Nearly 30 years later, its network of staff and volunteers continues to do just that. In a crowded Yellowknife building, women sleep on bunk-beds and three-inch mats rolled out on the floor. In the morning, they make breakfast together in the emergency shelter. Many spend their days on the streets and return at night, crowding around a television on couches and bottom bunks. Some women have been here, off and on, for more than a decade. They have bins with their names on them to hold personal belongings when they’re out. The shelter wasn’t set up to provide long-term housing for these women but it does because any other option is much worse. The Yellowknife Women’s Society squeezes everything it can out of that building. Not only is it a shelter, but it’s recently become a makeshift apartment complex. 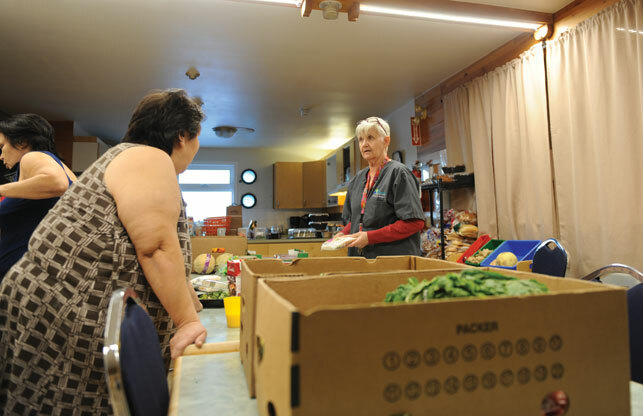 It hosts a walk-in clinic once a week and on a Monday afternoon in November, tenants sort through donated boxes of vegetables, fruits and other perishables. “We do what we can,” says the shelter’s manager, Margaret Cochrane. That’s an understatement. When the society learns about a gap in services, its network of dedicated staff and volunteers get to work to fill it. They dive right in to make the city safer for women and their families, and worry later on about the smaller, red-tape details that can bog down Northern institutions. In the last two years, the society has launched a half-dozen new projects. Inaction is unacceptable. Lauren Gostick works with the society, supporting the 22 women and men it’s placed in apartments around town as part of Housing First—a model for eliminating homelessness employed across the United States and Canada. She accompanies clients to meetings with the RCMP and lawyers, assists them in accessing health or social services, and checks in on them at their new homes once a week. She helps reacquaint them with the mundane tasks—doing dishes and laundry—associated with maintaining a home. Are any of her clients among those women who spent a decade at the shelter on Franklin Avenue? I ask. “Yes,” she responds. But with a tight-lipped smile, tattooed arms crossed in front of her, she conveys that I won’t be hearing anything more about that. She’s protective of her clients. And for good reason. Life isn’t easy for these people. They are caught between their community on the streets and their new living situations. Most of the requests Gostick and her team get from clients during their 24-hour on-call shifts are for help getting unwanted guests to leave their apartments. It’s a complication of suddenly having a home when few of your friends do. For a capital city, Yellowknife is still a small town. Their new neighbours may recognize them from the streets and don’t necessarily see them as equals. Gostick gets calls from these neighbours reporting her clients for carrying a bottle of wine into the building. “That’s not illegal,” she says. “True community integration hasn’t really happened with our folks.” Exposing them further—like, say, in a magazine story—wouldn’t help. Gostick has been co-ordinating Housing First—one of the Yellowknife Women’s Society’s most ambitious projects—since it began in 2016. It hasn’t been without controversy. The program doesn’t require a person to be sober or in addictions treatment to qualify for housing. In fact, this might make a person more eligible: Housing First is based on the premise that a stable home is a key step toward recovery. Critics see this approach as enabling. But it’s working. Five tenants are close to taking over their own leases. Last year, the society hired Annie Thrasher as a temporary consultant on Housing First. She had been homeless and worked at the shelter while staying there until she found her own place. "The Yellowknife Women’s Society was into harm reduction before it was cool." The society gives people what they need to build themselves back up—and this philosophy is apparent in everything it does. This fall, society staff were busy securing a new bank of apartments to lease out to homeless people who require less support than Housing First clients. And this year, under the direction of Lydia Bardak, a homelessness advocate and former city councillor, society employees and volunteers have been driving around Yellowknife from 1 p.m. to 1 a.m. in a marked van, checking in with people on the street and offering rides to a shelter, to the sobering centre, or to the home of a relative or friend. Funded by the city, Street Outreach came out of conversations with women at the shelter who spoke about the lack of safe and free travel options. In recent years, women’s issues have come to the fore. There has been a continental shift against workplace harassment and a national inquiry into Missing and Murdered Indigenous Women and Girls in Canada. Make no mistake, people have been talking about this for decades. The difference is that now, people are starting to listen. But that’s long been the mantra of the Yellowknife Women’s Society. It listens and then it acts. 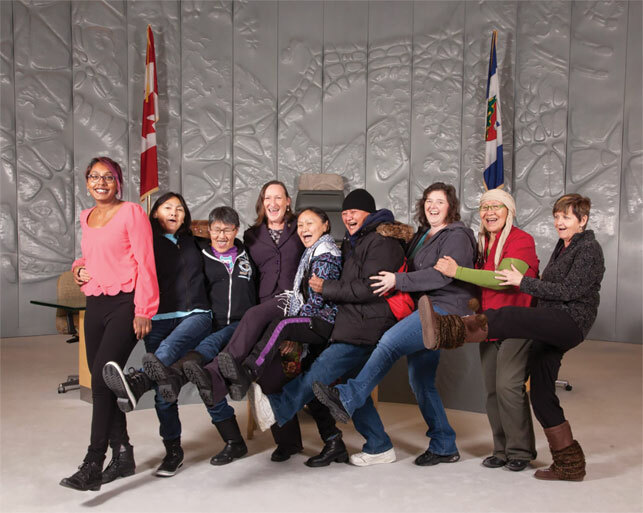 The Yellowknife Women’s Society spans the city. It runs a daycare in the city’s downtown that doubles as a family resources centre. It leases apartments throughout Yellowknife and sublets them to people transitioning from homelessness. It operates an emergency shelter along the city’s main throughway, Franklin Avenue. And if you spend any time downtown, you’ll no doubt come across one of the society’s white work vans, providing a safe ride to clients through its Street Outreach program or taking a work crew to a new job site as part of its Common Grounds initiative. “We find when we talk to women in our shelter about why they’re homeless, it’s usually related to family violence, family breakdown, the death of a spouse,” says Bree Denning, executive director of the Yellowknife Women’s Society. The territories have the highest rates of domestic violence in the country and Yellowknife draws women from across the North, often fleeing untenable situations with nowhere to turn. Advocates estimate Yellowknife’s homeless population numbers more than 500 people. Though there may be more men on the streets, Denning says that’s because women are more likely to find people to stay with—or remain in unsafe situations—to avoid homelessness. Denning is the face of the society now. She is diplomatic but unafraid of a fight. When Gostick tracked down safe inhalation kits to stock in the Street Outreach van for crack cocaine users, Denning signed off on posters emblazoned with the society’s logo to advertise the kits. Most executive directors wouldn’t want to rock the boat too much, Gostick says. But Denning jumps right in, putting her clients first. When the City of Yellowknife put out the Housing First contract, the Yellowknife Women’s Society was the only organization to submit a bid. Denning was on the society’s board for eight years. While completing a Masters in Social Work, she left to do her practicum at the women’s centre, where she recognized that poor health outcomes were symptoms of the dearth of social supports. 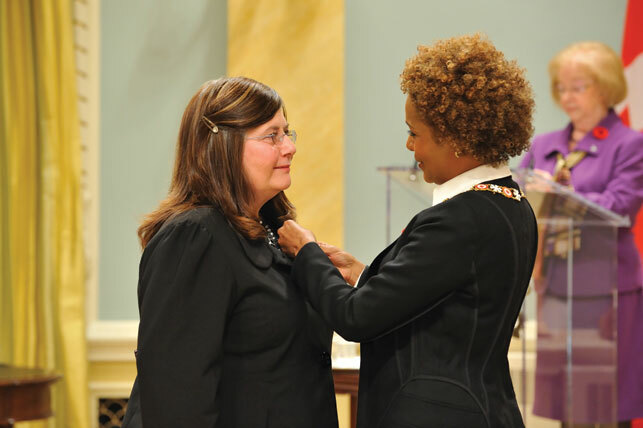 She took over as executive director in 2016 from Caroline Cochrane, who was elected MLA. (Now Minister of Education, Culture and Employment, and Responsible for the Status of Women, Cochrane declined to be interviewed for this story, in fairness to the other organizations operating in the NWT.) Denning is building on what Cochrane and the women before her put in place back when it was harder to get governments to invest in people kept on the margins of society. In recent years, the political winds have changed and given the society a boost, says Denning, adding the Yellowknife Women’s Society was into harm reduction before it was cool. “We offered our services in a non-judgemental and open way that didn’t require a test of sobriety or certain behaviours,” she says. “Harm reduction became the buzzword down south and then it caught wind up here. Housing First, housing as a human right, harm reduction services, meeting people where they are—all of that has kind of shifted in the funding world and the policy world. Yet the stigmatization of the homeless population still exists. And so does a lack of housing in a city with some of the highest living costs in the country. “There are some days when you really have to turn around and look behind you—at how much is being done—because you feel like you’re rolling boulders up hills,” says Denning. Women continue to die way too young and under tragic circumstances, she says. “It’s easier for me to keep having hope because I am seeing these changes, whereas change was not nearly so rapid 10 or 20 years ago. In the late 1980s, Yellowknife was divided. The R v. Morgentaler ruling came down from the Supreme Court in 1988 and took away the provisions that limited access to abortion. In the NWT capital, two established women’s groups were at odds over reproductive rights. “They applied a kind of dictatorship pressure on women to bring them all in line,” says Arlene Hache, then a reporter at the local paper, who would later go on to receive the Order of Canada for her advocacy work, primarily with the Yellowknife Women’s Society. Each side was interested in ensuring women made “the right decision,” she adds. The one that fit within their ideology. The voices of Indigenous women were largely absent from that conversation, though the NWT Native Women’s Association pushed to change that, says Hache. In the 1980s, the NWT NWA trained women for jobs in trades and launched a territory-wide awareness campaign about domestic assault and equal rights for Indigenous women. But in Yellowknife, women’s issues were very much shaped by a colonial framework. On domestic violence, Hache says, Indigenous women talked about support for the men in their families, about the importance of community and why leaving an abusive partner and a community was not so simple. These viewpoints were drowned out by the louder voices on either side of the public discussion. A group of roughly 30 women in Yellowknife got together around International Women’s Day in 1988. They wanted to listen to both sides—and anyone else in between. For two years, this group would meet regularly in whatever space was available. Over that time, these women came up with “a very innovative set of bylaws where neither a majority nor minority could control the decisions of the group,” says Hache. If there was consensus, the society would put the full weight of its resources and advocacy behind an issue. If there was disagreement, then tolerance, non-interference and peaceful coexistence would be maintained. And the Yellowknife Women’s Society was born. About half of its founders walked away at this point, feeling the organization would be wracked by indecision and never take action. They were wrong. Take an early example: a woman came to Yellowknife from Iqaluit to have an abortion after she’d been raped. The doctor refused to give her anything to ease the pain during the procedure, telling her this would teach her not to party, Hache recalls. There was an inquiry held in 1992 to look into how women having abortions were being treated at Stanton Territorial Hospital. It confirmed this practice. Not only had some doctors failed to provide pain relief options or anaesthetics, they had also inserted intrauterine devices immediately following abortions to prevent future pregnancies, which increases the risk of infection. This was done with dubious consent from patients. At that time, the society’s board was half pro-choice and half pro-life, says Hache. They sat down as a group. “The pro-life women said, ‘It’s not about abortion. It’s about how women are being treated when accessing healthcare.’ That was their focus.” These women put their abortion beliefs aside to take a public stance against this mistreatment. Recommendations from the inquiry changed the way women received healthcare in the NWT. Before taking on the position, Hache had bounced from job to job in town, ducking in and out of stores to avoid former employers. Once, she was reported as a missing person after failing to show up to work for a few days. Hache was struggling with mental health issues—she was overcome with an immense sense of guilt for what she perceived as her own lack of success and belonging. She had hitchhiked from southern Ontario to Yellowknife when she was 18 years old and was still trying to reconcile a childhood of physical, mental and sexual abuse. As soon as the society was established, Hache’s first move was to find a headquarters. She got in touch with a local businessman she knew, Andy Clark of Clark-Bowler Construction. He was the first person she called and he agreed to help without hesitation. The society now had six-months’ rent for a small house in the city’s downtown. “It was a dinky, shabby little place,” Hache says. A grant from the federal government kept the lights on and the doors open. But the society needed a place that could house its growing ambitions. “I found a list of empty houses the GNWT had and just harassed the crap out of them,” says Hache. “I approached Stephen Kakfwi, premier at the time, with that list of empty houses and I said, ‘I want one for our group because we have no place to be and we can’t afford rent.’” The territorial government was convinced and leased the society a five-bedroom bungalow on 49 Street for one dollar. (It happened to be the former home of a deputy minister.) This house became a drop-in centre and a safe space for women—a place they could go for parenting advice or to help navigate the territory’s bureaucracies, which were uninviting to them. The house was chaotic. “I smoked probably three packs of cigarettes a day,” says Hache. Roughly 50 women went there daily and Hache witnessed the prejudice these women—primarily Inuit, Métis and First Nations—constantly faced. The first time she accompanied a client to social services (to find out why the woman had been denied welfare) staff at the department turned them away, saying Hache couldn’t come into the meeting. Hache called up a lawyer friend and asked if the woman, who spoke little English, had a right to be accompanied. She did. They returned the next day only to be ignored for an hour until a manager stepped in and saw them. The drop-in centre was meant to be a resource for women seeking help. It certainly served that purpose, but it also became something else entirely—a shelter. Government officials and the fire marshal continued to pressure the society to come up with a better housing option for its clients. That’s when Hache learned of a large building on Franklin Avenue that had been vacant for over a year. “We went to our MLAs, we went to our government, and said, ‘You’re concerned about women sleeping on couches and on the floor. That building is empty. Give us that building and we’ll run a shelter for women who are marginalized,’” says Hache. “We put enough pressure on them and they rented that building to us.” But it didn’t come cheap. Rent was more than $3,000 a month. But she sees it differently. “I would put it as we met needs we weren’t funded to provide for.” The government paid the society to house 16 women—30 women slept there nightly. This year, the society purchased the five-bedroom bungalow (the same building it once sought as a haven, but had long since outgrown) as its new headquarters. Its downtown building remains the emergency shelter for women, but the society’s daycare moved out of the basement and into another location, freeing up space for eight single-occupancy rooms that share a kitchen and common room. (Priority is given to women who have been at the shelter the longest.) The monthly rent collected—from a tenant’s income support cheque or 30 percent of their income, if employed—has allowed the society to hire a social worker for its clients, while also allowing tenants to build up their credit. Eventually, Denning hopes to see the emergency shelter operate as a short-term solution in a city where anyone capable of living independently has that opportunity. Moreover, she wants to develop a female housing cooperative, so in the event of a family breakdown or the violence that so often leads to women becoming homeless, the woman’s equity remains and she gets to stay in her house, which is not often the case. There’s no seed money for this idea. Yet. Outside a Yellowknife gas station in early August, Michael Fatt hands me a brochure for Common Grounds. 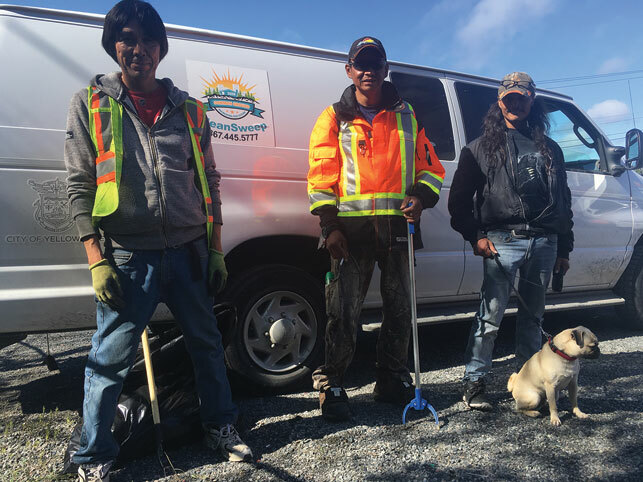 It’s a society-run pilot project funded by the city that hires homeless men and women to clean up public lands. Fatt is the manager. He drives crews of up to eight people to different sites around the city every day. Their biweekly paycheques come from city revenues generated by downtown parking meters, but Fatt and Denning both hope to see the program become a self-sustaining business. Fatt wants more people to get their hands on the brochures, so businesses and citizens start calling him for garbage cleanup. Michael Abel walks out from behind the gate that separates the gas station from a city-owned trail and drops a cherry Chapstick wrapper into a garbage bag. He bends down for another wrapper and Fatt stops him. “We’re not going to do anything on this side of the fence, just right up to where the fence line is,” he points. “Then when they see their mess... know what I mean?” The point is made. He wants their fastidiousness noticed so property owners start calling too. Fatt lives in a hotel right now because the landlords he’s talked to won’t accept him as a tenant with his pug, Smudge, who peeks eagerly through the passenger-side window of the crew’s van. Fatt was on the street for about five years. His community is still there. “I even have a nickname, a street name.” It’s Captain Jack Sparrow, he tells me, and I immediately understand why. He has long wavy dark hair, a patchy beard and, yeah, he does look like Johnny Depp. The Yellowknife Women’s Society isn’t the only group that supports women and their families in the NWT. The Young Women’s Christian Association (YWCA): It runs the Alison McAteer House (an emergency shelter for women fleeing domestic violence), Lynn’s Place (a transitional home), and, until recently, another transitional housing apartment building before it burnt down this fall. (All families have since been relocated.) It also offers youth leadership and family support programs. NWT Status of Women Council: It organizes an annual Take Back the Night event to call for an end to sexual harassment and violence against women. It hosts a vigil marking the Dec. 6 massacre at École Polytechnique in Montreal. It has also organized school campaigns and mentorship workshops to encourage women to take on leadership roles in their communities and to run in local and territorial elections. NWT Native Women’s Association: It runs a program for victims of violence and trauma. They offer emotional support, accompany victims to court, assist them with writing victim impact statements, and provide referrals to other services. It also runs a training centre where women can upgrade or take courses in English, math or science to prepare for new jobs or further education. It has been a strong voice during the Missing and Murdered Indigenous Women and Girls inquiry and hosted sharing circles for relatives and friends of victims.